The Becky Fund was established with a vision of aiding the children of Peru, who continue to be the most vulnerable victims of the crippling poverty of the region. of Peru with individual school supplies and almost 100 schools with teacher materials. In schools where the few items available are usually purchased by the teacher with his or her own money, these supplies can make the difference between a child having only a rudimentary understanding of the language and being truly literate, opening up options for that child’s ability to make a contribution to his or her community in the future. Throughout the region, children exhibit the signs of suffering from poor nutrition. These signs include delayed mental and physical development, and lower resistance to infection. In response to this need, a nutrition component, called “the guinea pig project”, was initiated in 2005. Focusing on a traditional source of protein in Peru, a plan was presented to the schools to provide the young animals. In the participating schools, the parents and teachers have made a commitment to build a habitat for the animals and to prepare meals for the children at the school. children, the Peruvian people see hope for lifting themselves out of poverty. I have just returned from Peru and wanted to update you on what was accomplished on this second trip. I was fortunate to be accompanied by Amy Mahowald, my stepdaughter from St. Paul, Christina and Ross, my sister and her husband from New Zealand, and an old friend from many Habitat for Humanity builds, Ann, and her daughter, Marie from Boston. We were an energetic and efficient team! This year we provided individual school supplies to over 3000 children and teacher materials to almost 60 schools. Our format is for each child to get a plastic bag and then go through our “assembly line”. They receive notebooks, pencils, eraser, sharpener, ruler, colored pencils and bread. From the looks on their faces you would think we were giving a trip to Disneyland. They are incredulous that they have something of their very own. The school receives a box of materials, including several kinds of paper, masking tape, glue, scissors, markers, pens dictionary, story books, puzzles, tempera paint, etc. These basic items are all the schools have to work with, and usually the teachers must purchase them from their meager salaries of a few hundred dollars a month. The big hit though is the volley and soccer balls that we give to each school; it is the only thing that they have to play with. This year we were able to get to some schools that are very remote (sometimes by pushing the van through mud holes, clearing rocks, etc.). Several of these are located where there are no roads. The children, teachers and some of the parents would walk several hours to meet us at the end of the road. It was such a moving sight to see a village coming down out of the mountains, often with a horse to carry the things back. That is certainly indicative of how much they value the help that we bring them. One village that came down became separated and we had to wait for them all to arrive. We had some balloons so we started playing with the children. They were reluctant at first to join in, or maybe they didn’t know what we were doing, but they soon got into it with great glee. I heard real belly laughs for the first time from these children. The look on the mothers’ faces as they watched their children laugh and play was worth the whole trip. Another day we traveled 3 hours to a town up the mountain. Along the way the driver of our van would honk his horn and kids would come running up the mountain from their homes. He would tell them in Quechuan, the indigenous language, that we would be back in a couple of hours and they should get the village together to meet us. When we arrived at our first rendezvous the village was there to meet us, all dressed in their indigenous clothing. The president of the parents association opened his cloth pack he carried on his back.his wife had sent lunch, Guinea pigs and potatoes. When we got back to the town we met a teacher who apologized that her school had not been able to walk down, as the 5 hour trip was too much for her 3-5 year olds. She told us that the walk up is 7 hours, (after the three hour bus ride) which she does with her 1-year-old child on her back. We were happy to leave the materials with her, which the parents would take back on horseback. Amy and I were so moved by this woman’s dedication that we both gave her our shoes. On the return trip they were waiting for us along the way, pouring up, or down, the mountainside. We stopped and gave out school materials, clothes and bread. It was amazing. At one of the schools the mothers wanted to cook a meal for us in appreciation for our help. We came back the next day after our work for the party. They were cooking in a kitchen with a dirt floor over an open fire. We were seated in the tiny nursery school size chairs and served a beautiful meal of stuffed peppers, potatoes, rice beet salad, and the dreaded Inca Cola. They had a local musician playing the Andean harp, his brother sang, and later we all danced in the dark because they have no electricity. Again, it is so humbling to have people who have so little share the best of what they have. Maybe the most exciting accomplishment this year was the establishment of the “guinea pig project”. I had been very concerned about the lack of good nutrition for the children, which contributes to their delayed mental and physical development. I had thought that having the schools raise chickens would be a good solution to this problem. After a long discussion with many teachers and other local people it was decided that that idea was a bad one. But, what did make sense was to do the same thing with guinea pigs. They are considered a delicacy, food is plentiful and free, the people know how to raise them, and they are extremely high in protein. A plan was presented to the schools that if the parents and teachers would construct the habitat we would provide the animals. We took precautions to ensure that this would belong to the children and the schools, the mothers or the teachers would commit to make a meal for the children, and this would be an on-going resource. When we left there were 6 schools that were ready to go, and money was left for other schools that wished to participate. It is likely that several other nursery schools will join the project, which is particularly beneficial if better nutrition can be provided at a younger age. Of course, all the schools want to know when we are coming back! The only thing I am able to tell them is that if we have money we will return. All the things we did this year, and there are many I haven’t mentioned, was done with only $7000. So, the future is up to you all, and your continued generosity. We are all plotting and scheming to figure out other ways to make money, such as adventure travel groups to the area that would include a donation to the Becky Fund, and building a school, etc. as part of the trip. If you have ideas, please pass them on. A big, huge thank-you to all of your for your love and support that made all this happen and brought some big smiles to some very poor children!!! 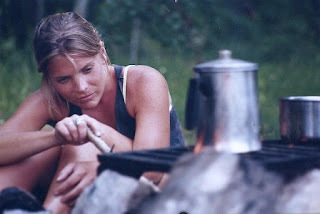 The Becky Fund was established in 2003 in memory of Becky Prichard. The following story by Trudi Hahn, was printed in the Minneapolis Star Tribune on June 22, 2003. Elizabeth (Becky) Prichard, who found her place in the world because political turmoil briefly trapped her mother in Bolivia, was interred June 15 in Calca, Peru. The St. Paul native, who had been running a restaurant in Pisac, Peru, drowned June 9 after a car accident near Calca, where she lived. She was 30. Friends and family members who gather Saturday in St. Paul will recall an adventurous woman who was delighted by the bright rhythms of Latin American culture. Prichard graduated from St. Paul's Central High School in an accelerated college-class program. She and her mother then traveled around Latin America for four months. "She never wanted to be tied down to doing anything normally," said her mother, Diana Bomberg of Las Cruces, N.M.
Prichard lived for a time with an aunt in New Zealand, where she became certified as a teacher of English as a second language. Fluent in Spanish, she worked in Minnesota for a while as an advocate for migrant farm workers, said her brother, Michael Prichard of Birmingham, Ala. In her mid-20s, she stayed with a cousin in Albuquerque, N.M., where she attended college, studying Hispanic culture. School associates wanted her to get a graduate degree, "but that wasn't Becky," her mother said. She would rather be off doing something new. "Every time she traveled, she'd miss her plane, lose her ticket, be late -- that was the source of a lot of her adventures," Michael Prichard said. About three years ago, Becky Prichard was living in Miami when her mother took a volunteer vacation to help build a house in Bolivia through Global Village Work Camps, an international branch of Habitat for Humanity. Bomberg suggested that they meet when the work was done so they could travel to the ruins of Machu Picchu. A rendezvous was arranged for Cuzco, Peru. Prichard got to Cuzco, but political turmoil in Bolivia prevented her mother from traveling for almost a week. By the time Bomberg got to Cuzco, Prichard had a host of friends and planned to move there. She agreed to work as a bilingual staffer in an adventure-travel company's office if they would train her to be a whitewater rafting guide, her mother said. "She wasn't afraid of anything," her brother said. "She would go trekking [alone] in the Andes for three, four days with her dog and a backpack." The whitewater work proved to be too adventurous even for Prichard, one of the first women to be a whitewater guide in Peru, her mother said. After about a year, she switched to assisting on trail trips. Tired of city life in Cuzco, she soon agreed to run a restaurant in Pisac. That situation didn't work out, but she liked the small market town, which was a jump-off point for touring Incan ruins, including Machu Picchu. Its children were so poor that their toys were pop-bottle caps. In May 2002 she embarked on remodeling an old building for a second-floor restaurant. "She'd say, 'Put a window there,' and somebody would take a sledgehammer and go bam!" said her mother, who was visiting at the time. From the chaos emerged an airy, open space where diners could observe the bustling market and gaze at misty mountainside ruins while choosing from Prichard's health-conscious menu items, which included fresh trout, alpaca meat and quinoa soup. She became engaged this spring to longtime boyfriend Mendel Wilson Muñiz, a Peruvian whitewater guide. She was treasurer at his daughter's Catholic elementary school, helping to raise funds for basic supplies such as aspirin and bandage strips -- or paying for them herself. The children had to buy their own supply kit of notebooks and pencils. If they were too poor to do so, they weren't allowed to attend classes. She tried to help a group of children who had been organized as a dance class that didn't work out, inviting them to sing in the restaurants on Saturdays for tips and food. On June 9, she was driving back to Calca from Cuzco after picking up Wilson when their car blew a tire and slid into an eddy of the Urubamba River. Wilson got out, but Prichard drowned because her seat belt got wrapped around her foot. Her mother, brother and other family members arrived June 11. A two-day wake ensued while Wilson's sister worked through a forest of paperwork and fees to get permission to send the body to the crematorium in Lima. The family took the casket to the airport on June 13, but the body never was put on a plane. In Peru, any traffic accident is considered a criminal investigation, Bomberg said. Authorities wouldn't release the body for cremation while the investigation continued, which might take a year. 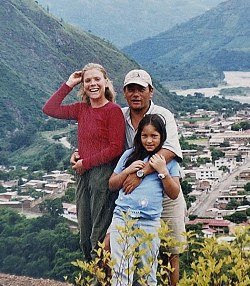 The only option was to leave Becky Prichard's remains in Peru. She was interred June 15 in the bright orange section of Calca's outdoor mausoleum, next to the purple section. In addition to her fiancé, her brother Michael and her mother, survivors include her father, Michael Prichard of St. Paul; another brother, Alexander of Fairbanks, Alaska; her grandmother, Jane Rogstad Hawkins of Scottsdale, Ariz., and five stepbrothers and stepsisters. Becky's fund has 501(c)(3) status and donations are tax deductible. the GuideStar Network For Good.